Picking up our discussion on the new product development life cycle, we last talked about R&D and before that feasibility. The next department to work on the new product is marketing. The person who will announce to the world the arrival of this new kit is the Product Manager or Marketing Manager. Today's article is a lesson on how to calculate the size of a market and how to estimate how much money one can make in that market. During feasibility, marketing provided the committee a financial analysis of the product. This is called the "business case". The key concerns are always around the numbers. There are numerous tasks to keep track of in preparation for a product launch and most of the early tasks revolve around market and cost analysis. The later tasks revolve around the creative aspects of marketing the product (design of a logo, slogan, graphics, website, promotions, etc.). What I call the fun stuff. Before you can get to the fun stuff, you have to have an almost finished product. So that means the bulk of the marketing work is analysis. So let’s walk through an example of how we figure this information out. It’s all a big guessing game really. Just speculation. Personally, I think the reason I didn’t like marketing more is because the answers are not certain. There is no way to know. These are just estimates based on surveys and talking to people. Pretty much, the opposite of molecular science. We were talking about protein expression so let’s keep going with that example. I did a google search and happened to pull up an excellent market report on prokaryotic protein expression. This info is perfect for teaching this lesson. These market reports usually cost $2000 (+/- $1K) so I was pleasantly surprised to find this one for free. Now, we need to figure out how big is the market for our product. To do that, we need to narrow it down. 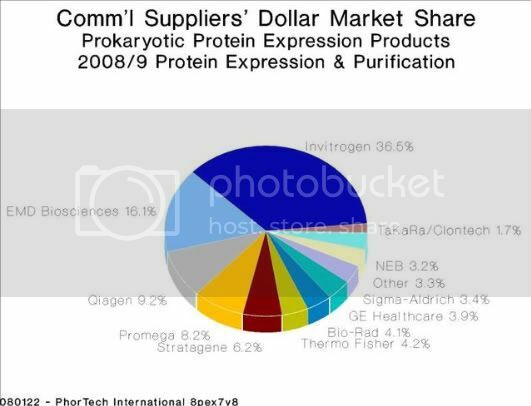 Prokaryotic expression is just a small piece of the total protein expression market. Other areas include Baculovirus, Pichia, and in vitro translation. We want to focus on our subsection. Let’s start by looking at the revenue for all protein expression. 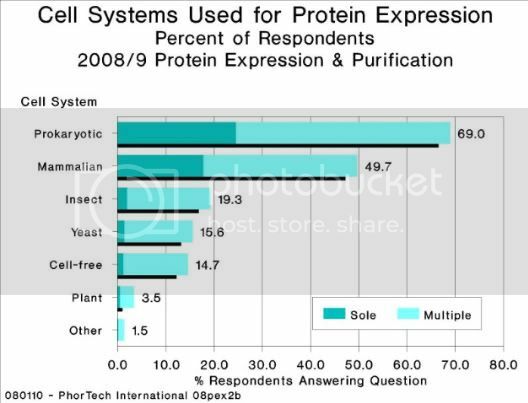 According to the market report, in 2008, $200 million dollars was spent on protein expression in the U.S. So what we need to know is: how much of that was for prokaryotic protein expression? This survey data gives us some insight. This data is a bit confusing because of the way they combined the answers, so for the sake of discussion, let’s just say it’s 70% prokaryotic expression. So 70% of $200 million means the target market is $140 million dollars. And that's only the US dollars. No wonder it was approved! Another good piece of information to have is: how many people want to isolate native protein vs. denatured protein? And another question I would want the answer to is: how many people say that inclusion body formation or protein folding is a problem for them? If I can’t get that info from a report, I would do a survey of my customer base (in the form of a survey monkey) and get the information that way. Let’s pretend we did a survey and got the answers. The survey told us that 50% of all the customers want native folded protein. Of these people, 90% said that protein folding or inclusion bodies were the primary obstacle for them. So how big is the pie? $140 million divided in half is $70 million and 90% of this is $63 million dollars. So the potential money to be made if we converted 100% of the potential labs to our product is $63M (US only). We won’t get 100% of them though and certainly not in the first year. That takes us to the next question, which is: What % of that $63 million can we get? This question is tough because here is where you make some guesses. How much really depends on how good the product is, on our leadership in the market and also our competitors, if the product is competing with an existing one. So let’s look at that. Here we see the breakdown of the leading companies in prokaryotic expression (and purification). If I work at a company like Invitrogen, and am the clear market leader, then anything released probably is adopted very quickly because the customers know and trust the products. If we are at a small company or a new company with very limited marketing money (the 3.3% in the “other” category), it will be a lot more difficult to convince scientists to try a product like this. I would require very strong proof data and a few endorsements from academic labs for launch. In this new product example, the invention is brand new and has no competition. The closest thing is the Takara product. So in this case, how do we figure out how much money can be made and how many kits will be sold? Well, I would first figure out what price I wanted to sell it for. Let’s focus on the vector. The Takara product is a set of plasmids and they are charging $220 for 1 ug of 5 plasmids. But this invention is better so we can ask for more than Takara. Let’s go with $300 for a kit. (We all know what it costs to prep a plasmid. A Maxi prep will make enough DNA for 500 kits. After QC, aliquoting, labeling and packaging, $300 will be a very nice return). Next, let’s say we work for a company that already sells other protein expression vectors, so we can get a good idea of how many kits we will sell based on current demand. Let’s make up numbers. We looked at our sales data and currently we sell 500 kits a month of other popular protein expression plasmids. But this one is unique and solves a huge problem for people. So I am going to go out on a limb and commit to selling 1000 kits a month. But you don’t come right out of the gate at 1000 kits. It usually takes time to ramp up. So I will break it down month by month, of the number of kits that I think will sell. It is important to have some level of accuracy with this information because the production team is going to build whatever number the product manager says. If the number is too high, kits may expire on the shelf. Too low, and there will be backorders and angry customers. So based on my predictions, I say we can sell 10,000 vector kits in the first year and at $300 each, that’s $3 million dollars in year one. Going back to our $63M target market, that means we are predicting to gain 5% of the US market in year one. The committee wants my predictions for year 2 and year 3 also. Based on how fast the protein expression market is growing each year, we make more predictions. I tell them, we will sell 12,000 in year 1 (20% growth), 15,000 in year 2 (25% growth), and 20,000 in year 3 (~30% growth). I expect the product to grow more each year as news of the product spreads via word of mouth throughout the protein community. Cumulatively this product will bring in revenues of over $14 million within 3 years if the vector works for ALL samples tested. And that’s 22% of the target market and 7.5% of the total prokaryotic protein expression market (in 2008). That should nicely pay back the R&D investment plus the cost of patenting the invention world wide (patenting costs ~$350-$400K currently) in a relatively short amount of time. Throughout the development, as R&D progresses, the numbers are adjusted as we learn what the product can and can’t do. If it can’t work well for some protein types, we bring the numbers down. If it’s a home run, we keep them high. We live and die by the numbers. And that’s how you predict how much money a product might make. Another important aspect of marketing is beta testing the product with selected customers. This demands a lot of attention because researchers often forget to test the beta kits or will not have time after committing to try it. The feedback from these tests helps determine how popular the product will be, what features are most liked for marketing, and will provide more credible data for scientific technical notes and the website. So what else does the marketing person need to do before a product launch? - Plan all the tactics- all the ways to disseminate a message: email blasts, banners, trade shows, etc. The list goes on and on. And this isn’t the only product the marketing manager is working on. Being good at marketing requires strong attention to detail and organization skills. If attention to detail is not your forte, do not go into marketing. Marketing has a lot of responsibility when it comes to new products. How well a product does and how fast it takes off is a reflection of your marketing abilities. How well the products sell that are under your command will impact how much of a raise and bonus is rewarded at the end of the year. Planning for new products occurs months in advance and many critical decisions rest on the product managers’ shoulders. And then even after it launches, and R&D and Operations have moved on to new projects, the work continues for marketing. It never ends. And that's why they make the big bucks. Wait this is a $200 million dollar industry, and no one has figured out how to express active plasmodium proteins yet?!!! Seriously, this is really interesting. It does not sound fun exactly, but kind of an entertaining puzzle in some respects to work those numbers/get them as accurate as possible. LOL- it is way more than $200M actually. Because that was just the US. It is probably around $345M US now in 2011 and US is usually 60% of the market and the rest of the world is 40% so if we add on 40% of $345, we have another $138M. That comes to $480 million or roughly a $500 million dollar market. It is more like a puzzle type of fun but I personally found it very stressful. I don't like not being able to know for sure. It made me anxious to have to commit to selling a certain amount of a product over a three year period based on extrapolations of market reports and surveys. And then constant worry about making it and constant pressure from the upper echelon to stay on target. And if I did better than I forecasted? I'm a sandbagger. It takes a steel stomach to do that job. Wow marketing takes a lot, knowledge of product science and people. I see why the big bucks are made here :) Thanks great post and great insight always enjoy your run down on things! Funny enough, I wrote a post on this topic on BenchFly afew days ago. My post was a little more of an overview / back-of-the-envelope approach for inventors who may not have detailed market data (which is probably most of them - at least at the time of initial conceptualization). Thanks Alchemystress. It is true- having the science background and being good with people are very important. More than an MBA, in my opinion. Hi Carlton- thanks for reading and commenting. What do you guys do with the expiring/expired stuff anyways? Toss it, give it to labs who want to play with it, etc? We would toss it if it doesn't work. We would re-QC it to make sure it works and then can continue selling it. If it looks like there is overstock and it needs to move fast, there might be a promotion for it (3 for the price of 2 type deals) or the sales force will be asked to push more of that product. If a component expires and the rest of the product is fine, I would take the good stuff for R&D. It's not easy to re-work products to swap out expired parts because the lot# has to change which means all the labels on the box have to change so that means the entire product needs to be re-assembled in a new box. It's a ton of work. It would depend on thequantity on the shelf, and the cost of the kit vs. the cost to re-work it whether we would choose that option. How is the marketing dept organized? In some companies, the product manager is assigned a line of products to manage. So for example, in a large company like a Life Technologies, there would be a product manager for cloning and protein expression, another for transfection products, one for qPCR kits, etc. Your job is to manage everything having to do with that product and the future products. Some companies have the labor divided differently. They will have a product development manager and a marketing manager. In this scenario, the product development person is more technical, works with R&D to design new products that match the needs of the customer, and helps get it launched. The marketing manager does all of the tactics and actual marketing of the product to the sales force and to the customers. Personally, the first method is better. The second is more confusing and results in people fighting over what is and is not their job. Do most of the marketing folks have marketing or science backgrounds? Most have a science background or worked in a lab. Some do not but have an MBA and I do not believe they are as good at the job. They struggle more than the PhDs who transition to marketing with no experience. Many companies will promote scientists from technical support into marketing. I also know R&D scientists who went into marketing. They learn marketing on the job. I think its pretty intuitive- who knows what scientists want and need better than a scientist? Marketing does require an outgoing personality and the ability to focus on dollars and cents as the measure of your success- things that are not always easy for a scientist. However, the pay is so much higher that many scientists make the change simply for that reason. How do you identify people to survey? If you are surveying your own customers, most big companies have all the data organized so that you can choose subsections. For example, you can choose all the people on the "protein" mailing list or the "Probes" mailing list. You can pretty much choose your lists based on whatever customer segment you want to reach. Maybe you want to survey cancer researchers only, so you can go to all the leads collected from the AACR conferences and send to them. Or, for a hefty price, you can usually buy the AACR or other conference mailing lists. Most of the conferences do not give the information to the company. They will have the company send them the email blast or info and they will send it for you. This way the scientists information is not being given to anyone else. And it only gets used once. If you need to survey a group of scientists for which you have no names- maybe it is a new market for you, then you can purchase lists from journals or trade magazines too. Some of them also send the email for you and do not give actual contact info. One issue that comes up is when multiple product managers are sending email blasts or surveys and are choosing the same list. Then some customers get too many emails a week from the same company and they start to complain. So it is someone's job to manage how many emails get sent out, which customers are getting them, and prevent more than one email getting send to the same customer. If two people both want to use the "epigenetics" mailing list, then one person goes first and the next person can use it next week. Otherwise you get people unsubscribing, and you don't want that.